Every once in a while a book comes along that grown ups want in their library, 'though it's meant for children. 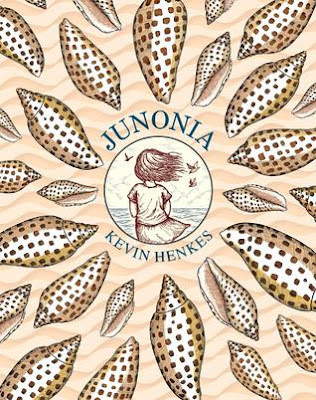 "Junonia" is just such a book. It's meant for children ages 9-12, but while they may appreciate it...parents will, too. This special little book is inviting from the cover. A small girl's back calls us back to days when we were a child; watching the summer water, looking for adventure, finding special shells, spying birds and studying what they're doing, discovering sea creatures, and burning in the sun... Like Alice of "Junonia" we were expecting adventure and magical things to happen, weren't we? "Junonia" is a beautifully illustrated book inside and out. This small volume reminds me of a book I've treasured all my adult life, and have given as a gift to many friends, "A Gift From the Sea" by Anne Morrow Lindbergh. While Mrs. Lindbergh's book is written from the perspective of a woman who's seeking solitude, peace of heart and wisdom that comes in the journey, Mr. Henkes brings us the same such journey from a child's heart. His addition of Alice's birthday symbolizes this journey, too. The secrets of a child's heart is one of the rare beauties of Mr. Henkes's book. He shines in his ability to understand the longings and joys of a little girl's feelings. His ability to tranlate those intimate emotions is a mark of his depth of sensitivity and talent. This is an unusually sweet and heartfelt book. I recommend "Junonia" to those who would like to give a special gift to grandchildren, family and friends. I recommend it as a gift for yourself. It would be a beautiful gift for a friend in need of comfort. It's a wonderful little book to keep close in the wintery days when we forget how warm and joyful sun and summer can be...how the search for a special shell can bring a sort of joy to our hearts no matter what age we are.